High Contrast House - Inspiration for the rear extension has stemmed from its context, a garden of mature timbers and greenery. The pitched roof mirrors existing roof pitches, a simple form enhancing the shaping of the existing site, within this conservation area. 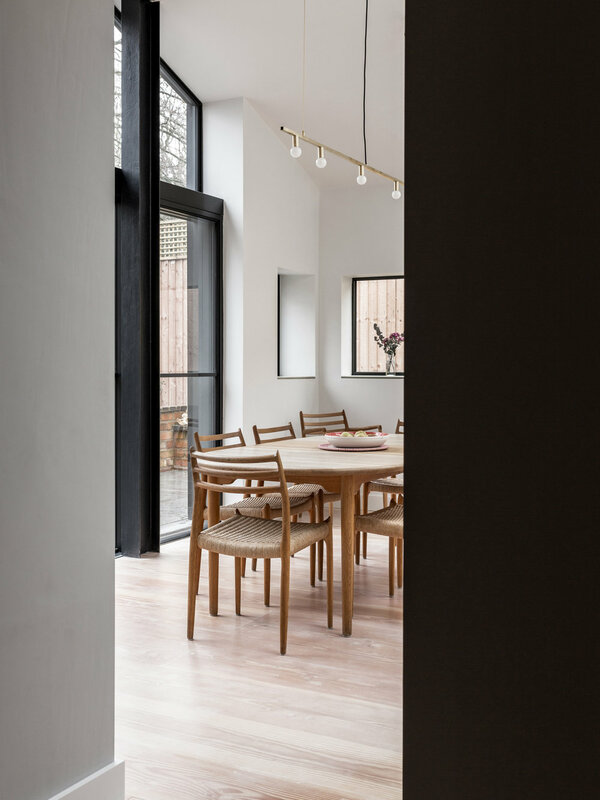 As a key feature to the exterior, the charred black timber clad provides a unique and hardwearing character to the form, with black aluminium Crittal windows, a black zinc roof, and flat profile frameless roof lights, shaping the natural light entering the new and renewed spaces. To the landscape, blue limestone slabs offer tonal variation from the darkness of the cladding frame, and create a natural level threshold crossing out to the exterior.